Rainforest Resorts are ideal for an intimate couples getaway, be it a honeymoon, anniversary, birthday or simply the opportunity to get away and spend some quality time together. 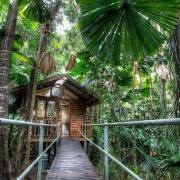 Boutique rainforest accommodation comprises of individual timber cabins that are set apart in the rainforest, to provide you with the uptmost peace and privacy. 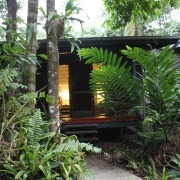 Here you can enjoy the wonders of the rainforest from the comfort of your cabin. 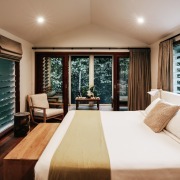 Boutique cabins are designed to fully immerse you in the beauty of the rainforest, whilst providing all the creature comforts of a boutique retreat. Warm natural tones create a relaxed and soothing living space and with additions such as a spa bath, private verandah, and luxury toiletries you will not want to leave. The rainforest is the perfect destination for those who are in need of some self nourishment. With the added facility of a day spa, you can take away a lasting sense of wellbeing through a complete body, mind and soul experience. Treatments are designed to harness the power of nature through the use of clays from the earth, flower and plant essences, herbal extracts and hands on therapy. These modalities integrate the wisdom of ancient cultures, medicines, spirituality and healing, that create a unique experience for the mind, body, soul and spirit. Dining is an intimate experience in the rainforest, which is made even more spectacular when when lit up by candlelight in an open air setting. The use of locally sourced produce based on the season is widely incorporated into the menus. 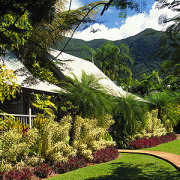 The Daintree Wilderness Lodge caters exclusively to Daintree Wilderness Lodge guests only. In line with their advanced eco-accreditation, much of their produce is organically grown and locally source, they create all of our dishes from the ‘ground up’ free from preservatives and majority gluten free. Evening meals incorporate the best local produce including Wild Barramundi, prawns and King Tiger Prawns from the Gulf of Carpentaria and Atherton Tablelands Prime Beef. For a special occasion, Silky Oaks Lodge offers private riverside dining which is available in a secluded setting on the Mossman River. Enjoy a 3 course menu, with your selection of wines, the glow of candlelight, the sounds of the rainforest and river surrounding you. 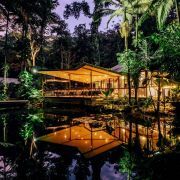 The Daintree Eco Lodge offers a fusion of native bush-tucker and contemporary Australian cuisine at their restaurant 'Julaymba', the local Kuku Yalanji word for “Daintree River”. Nature is integrated into every aspect of the resort, with a focus on using prime native ingredients fit for the seasons, some even collected on the property, you will find fresh, healthy and innovative dishes suitable for every palate. 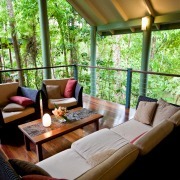 The Daintree Wilderness Lodge is a wonderful example of low impact building. Many trees were simply built around with some original trees and vines now growing through the floors and roofs. Only two trees were removed during the entire project. Clearing was done by hand (crow bar and shovel). No machinery at all was used. No rainforest timber was used. Cyprus pine was used. All services were placed above ground to prevent any disturbance to the forest floor. It has always been the ethos of Silky Oaks Lodge to embrace the environment. 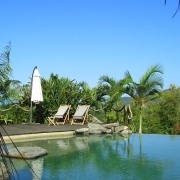 The lodge is highly sympathetic to its natural surroundings. Originally built on a portion of a farmed and cleared land adjoining the Daintree National Park; for the past 25 years this land has been regenerated and replanted back to the original rainforest habitat. 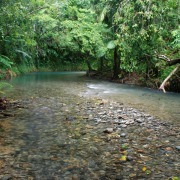 Therefore their 'Eco-Certified -Advanced Ecotourism' status has a solid sustainability foundation due to this reforestation of land the Lodge occupies. 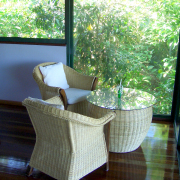 All water from the Lodge is drawn from the Mossman River and is treated on site with a sand filter and chlorination plant with the result being a pure minimally treated spring water of a high standard. 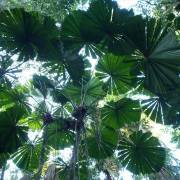 A close relationship with the local rainforest Aboriginal community is a priority to the Daintree Eco Lodge. This site is important to the local Kuku Yalanji people (the original inhabitants of the site) where forefathers of the Kuku Yalanji tribe used it as a resting place, as it provided spring water, an abundance of edible and medicinal plants, fauna, bathing holes, and protection from harsh weather conditions. 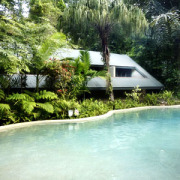 The Daintree Eco Lodge endeavours to preserve and share the culture and conservation of the environment through supporting employment to over 50 Indigenous personnel, and providing experiences that are in harmony with nature and in respect of culture – inspired by the rainforest Aboriginal people. Architecturally, the treehouse cabins have been designed to minimise interruption to the ancient fragile environment, and to capitalize on the valley’s own micro-climate.